Few days after New Year everyone will speak or write blogs how it is necessary to start with the new diet or detox after holidays, together with thousands of goals that we have to complete. But not me, I will just stick to something that makes me happy. It is the off-season for our food tours so we have more time to enjoy winter comfort food with our family and friends. I love these traditional winter dishes because they need to be cooked slowly which creates warm and cosy atmosphere around the fireplace while outside is freezing cold. And it is our traditional cooking that is passed through the generations and written in our DNA. If I start writing about all recipes it won't be any more blog but cookbook! That is the reason why I will pick just a few that I find the most interesting: Breakfast – Homemade bread topped with lard. Consumption of the pork fat started to be a new trend of the nutricionists after being marked for decades as supremely unhealthy. Probably 30 years ago I was pioneer as it was my favorite ˝Nutella˝and now my daughter follows in my footseps. It was a food product eaten by poor people who couldn't afford to buy meat after the World War II ended and it spread throughout Eastern Europe. It is usually eaten with salt or red paprika on top. But somehow sweet version with sugar spread on top was always my favorite treat. Lunch – Green cabbage stew. 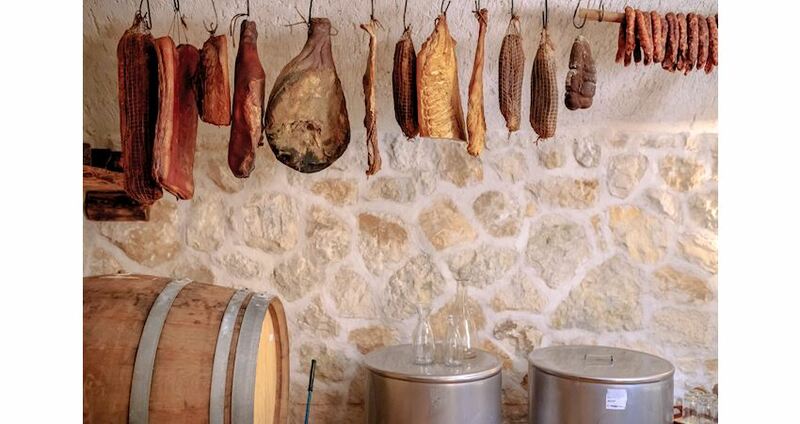 It is one of the most mentioned myths on our food tours in Dubrovnik. Why myth? Because 99% of our guests don't have the opportunity to taste it as they come during the summer months when there's no cabagge. It is historical dish already mentioned in our cookbooks of the 15th century. There are many versions of the same stew, as everyone adds some secret ingredient but original, very simple way of making it, is the best. This recipe is taken from one of our favorite books „Traditional taste of Dubrovnik“ : Zelena Menestra ( Green cabbage stew) 1kg of dried goat meat 1kg of dried pork meat ( 600 gr smoked dried bacon 500 gr homemade dried pork sausages 2 kg od collard greens 1 kg of cabbage ( raštika) Cut meat in chunks, wash and boil. Discard the water, and then bring to boil in a new water. When the meat is half done, add potatoes ( 800gr), then cabbage, and cook until tender. At the very end , add the melted lard mixed with olive oil. There should not be a lot of liquid, thicker is better. Serve warm meat and sausages on plate, and cabbage with potatoes in a bowl with a little bit of liquid. Instead of potatoes that were brought from America in the past time barley was cooked instead. Dinner – is there better evening than gathering around the open fireplace with a simple snack that warms your heart? My favorite snack are half smoked sausages or smoked bacon ( pancetta) on wooden sticks roasted over the fire. It is our version of the marshmallows. When sausages or pancetta start to melt you put them on the homemade bread baked under iron bell few hours before on the same fire place. You can combine this with famous sack cheese from Herzegovina ( in Croatian: Sir iz mijeha) as one part of my family tree is from there. It is cheese made from sheep or cow milk which matures in the sacks made of sheep skin. Already on the beginning of the 14th century people of Dubrovnik were eagerly waiting the merchants from Herzegovina to buy from them this precious cheese. With the strong scent that comes from the sack, flavour on the other side is surprisingly delicate, and compact structure melts easily in the mouth.